Click onamazon.com/author/carmen-cordovaand start the journey. There are numerous methods employed by spirits to communicate with us. One method, commonly used, is dreams. Spiritual dreams, as I prefer calling them, provide the means of a common ground of communication in which both frequencies-theirs and ours-become one. From the beginning of time, spirits have utilized dreams to warn us about unforeseen dangers, give us spiritual inspiration, let us know that they are all right and much more. 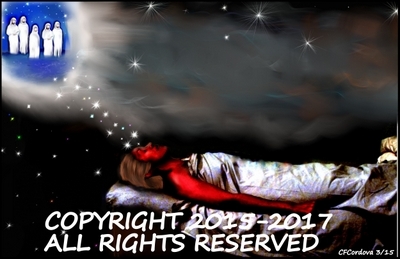 Numerous individuals have reported receiving messages from spiritual masters, angels, saints, and spirit guides while in a dream state. And, the list of reported cases continues to grow. Two of the most famous cases of spiritual dreams are the foretelling of Mary’s physical condition to Joseph, and the warning to flee to Egypt with Mary and Jesus to avoid the, "massacre of the innocents." "An angel of the Lord appeared to Joseph in a dream. He said, 'Get up and take the child and his mother and escape to Egypt. Stay there until I tell you, for Herod is going to search for the child to kill him.'" Matthew 1:20. Additionally, Melchior, Caspar, and Balthazar, the Three Wise Men who visited Jesus immediately after his birth bringing gifts of gold, frankincense and myrrh, had a spiritual dream in which they were given a warning. "And having been warned in a dream not to go back to Herod," the Three Wise Men, "returned to their country by another route." Spiritual Dreams are wholly different from regular dreams. Upon awakening, you feel as if you physically experienced it. Every detail of the dream seems very tangible. Approximately, a month after returning from India, I had a dream with my mother. She appeared healthy and happy. She seemed so real that I kept saying, “I thought you had died…how could this be?” I was astounded. My mother’s presence created a sense of indescribable happiness. She assured me that she was well. Furthermore, she lovingly asked me not to worry. We held hands, talked, hugged and kissed. Every gesture and touch felt so real. Upon awakening, my mother's essence remained with me for several hours. Although my conscious mind kept reaffirming that it was just an ordinary dream, another part of me kept saying, "No, this was different." By the end of the day, I was utterly convinced that the dream was out of the ordinary. My mother had appeared in my dream to share a precious moment with me and assure me of her well-being. Many years ago, I had another riveting and unforgettable spirit dream. I dreamt that I was alone on a beach staring out at the horizon. The ocean was serene. From a distance, a diminutive luminous object appeared. It began moving slowly towards me. As it continued to get closer, I could see the image of Jesus Christ. Unexpectedly, the image transformed into a lovely woman. She had long silky black hair. 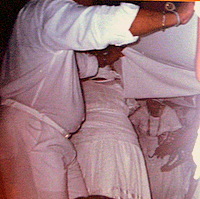 Her dress was white and long, and the top of her head was embellished with a large glowing star. Her arms were extended out with the hands in a semi-closed fist as if holding some object. As the woman continued to approach me, I heard a voice say, "Yemaya". Additionally, the voice instructed me to wear a necklace made of blue and crystal beads. By the end of the message, I woke up. Even though I was fully awake, I could hear a voice from a distance repeating the same message, "...a necklace of blue and crystal beads." Although the spirit dream was extremely vivid, the significance was beyond my comprehension. Without a second thought, I got up, dressed and headed to a nearby botanica- a religious good store where one can purchase spiritual items imported from all over the world. When I walked in, I immediately noticed two large jars on the counter. One jar contained blue colored beads while the other consisted of crystal beads. Next to the jars was a medium-size picture of a woman who had a strong resemblance to the person from my dream. The woman in the picture was called Yemaya. Occasionally, I have gone back to the botanica and not seen the jars with the blue and crystal beads. One day, out of curiosity, I asked the store owner about the beads. To my surprise, she said they did not carry them anymore. Although I thought it was odd, I did not enquire any further. Upon the completion of the necklace, I began to experience a powerful urge to paint a picture of Yemaya. By the end of the painting process, I felt a strong connection to Yemaya. It was as if a new friend had entered my life. Although the necklace and the Yemaya painting were completed, the mystery of the dream remained unsolved. It was not until a few years later that the enigma was unraveled. While visiting Brazil, I attend a Candomble ceremony in Bahia, Brazil. 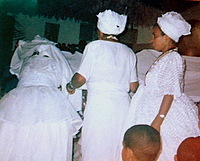 Candomble is a religion in which its members worship African deities or orishas. The first thing, I noticed upon entering the ceremonial gathering place was an enormous Yemaya painting. It was as if she was welcoming me. In the middle of the ceremony, a woman dressed in white with a white headdress, and several long beaded necklaces approached me and started to talk. Although my Portuguese was extremely awkward, my translator was helpful in relating the message. The woman said that Yemaya protected me. Furthermore, she said, Yemaya wanted me to wear a necklace for protection against negative energy. The necklace would serve as a spiritual shield. She depicted me as being a sponge absorbing the negative energies of other individuals. When I showed her the necklace, she smiled and blessed me. The woman's comparison of me being like a sponge was accurate. Prior to attaining the necklace, I would feel depleted every time I encountered negative individuals. I would develop low-grade headaches and feel as though my energy was yanked out of me. Without a doubt, the necklace turned out to be a spiritual shield. When dealing with extremely difficult and confrontational individuals, I remained grounded and serene. 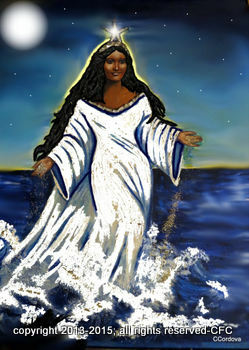 Yemaya is the Goddess of the Ocean. Therefore, every time, I would visit a large body of water, I paid my respects. I would ask permission to cleanse my necklace and thank her for the many blessings. Click here for an update on my Yemaya necklace. As for the Yemaya painting, it has become therapeutic for some individuals. The painting is displayed in my parents’ home and seen by all who visit. On one occasion, I noticed my parents' neighbor standing in front of the painting. She appeared to be praying or talking to Yemaya. Intrigued by the woman's behavior, I questioned her. She said that she was asking, "La Senora" (which means lady in Spanish), to help her with her illness. "When I come over for a visit, I usually pray to La Senora. I always feel a sensation of peace and healing inside me," she revealed. Several years later, I painted a second picture of Yemaya. The idea was to have a painting of Yemaya in my apartment. I cherish both paintings. Although many years have gone by since my spirit dream with Yemaya, I feel she continues to protect me in many ways. Whether you believe or not, spirit dreams are definitely meaningful. Even though the meaning may not come to you immediately, it is important to write the information down and save it for future reference. At first, my spiritual dream with Yemaya did not make sense to me. However, in time, it began to unfold and reveal its true meaning. Never underestimate your spirit dreams. They contain treasures beyond our imagination.